Is it a bird? Is it a plane? No, it’s … well, actually it is a bird. Sort of. 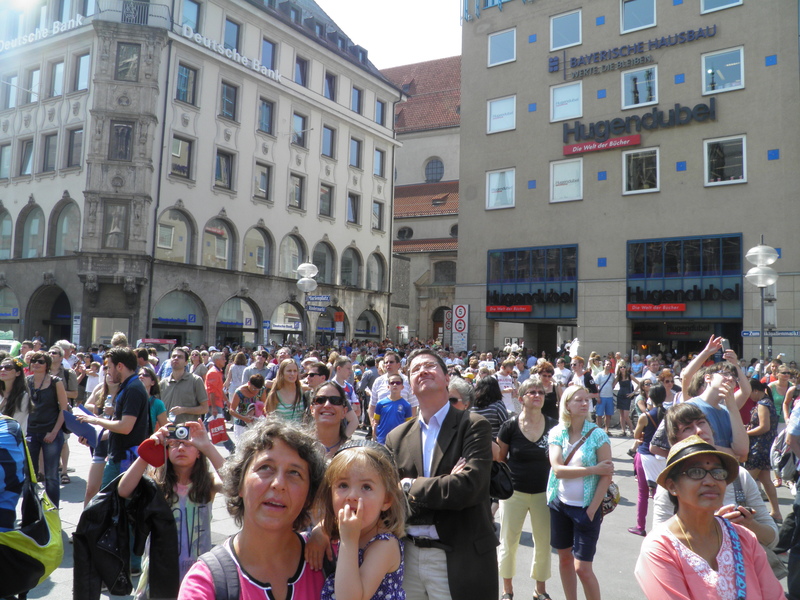 Every day Munich’s city hall is transformed into one large cuckoo clock for the amusement of tourists and anyone who happens to be in Marienplatz at the time. By ancient tradition – ok, just over a century, but why spoil it? 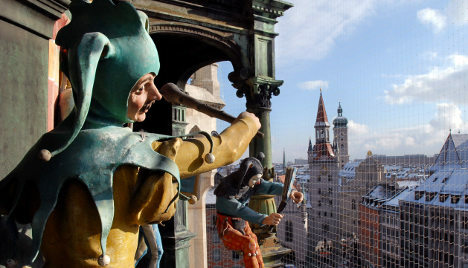 – the Glockenspiel – or carillon, as the French would call it – cranks up and commences its 15 minute performance of dancing mannequins and clanking bells either once or three times daily depending on the time of year. Possibly the most gazed-at figures in southern Germany. A much loved icon of Munich tourism, the Glockenspiel is embedded on the central tower of the imposing neo-Gothic (which is an intellectually polite way of saying “fake medieval”) Rathaus, built in the late 19th century after more authentic and therefore more humble medieval buildings were demolished to make way for it. The performance officially commemorates two events in the history and folklore of Munich. The first is the wedding of Duke Wilhelm V (whose sainted memory is forever to be toasted as the founder of the Hofbräuhaus) to Renata of Lorraine. The happy couple were to 16th century Bavaria what Will and Kate are to Britain today. The second is the “cooper’s dance” of apprentice boys cavorting through the city in defiance of the plague in 1517. The first event actually happened; the second belongs more to the realm of popular fable. The show also features a horse jousting tournament – untold tens of thousands of daily contests and Bavaria has yet to lose – and, oh yes, what appears to be a chicken squawking three times at the end. Do not miss the chicken. You have not experienced the Glockenspiel if you miss the chicken. Uniquely, Munich’s city hall (“Rathaus”) also double-jobs as the world’s largest cuckoo clock. 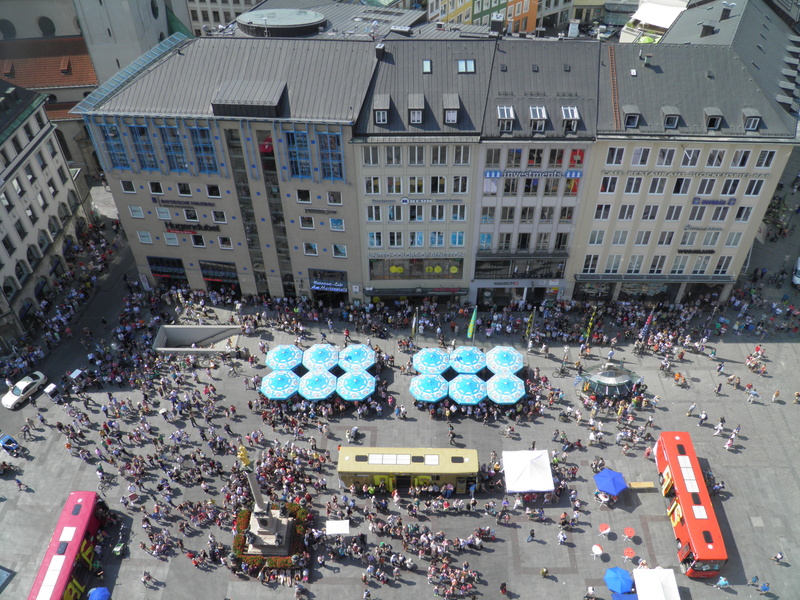 The Glockenspiel primarily exists today to delight tourists and torture tour guides. After a guide has had to stand through the full show for roughly the hundredth time, some small signs of mission fatigue can manifest – the thousand yard stare, the soft mumbling and twitching, the tearful questioning of the purpose of life. This can be more entertaining than the Glockenspiel itself, but nevertheless we encourage our customers to report any such behaviour on the part of guides to us, as here in Radius we have an excellent rehabilitation programme involving some R & R in the salt mines of Obersalzberg. Before you know it, they are back, refreshed and chirpy, and happy to answer your questions about why the guy in red keeps falling off his horse, and is that a chicken? 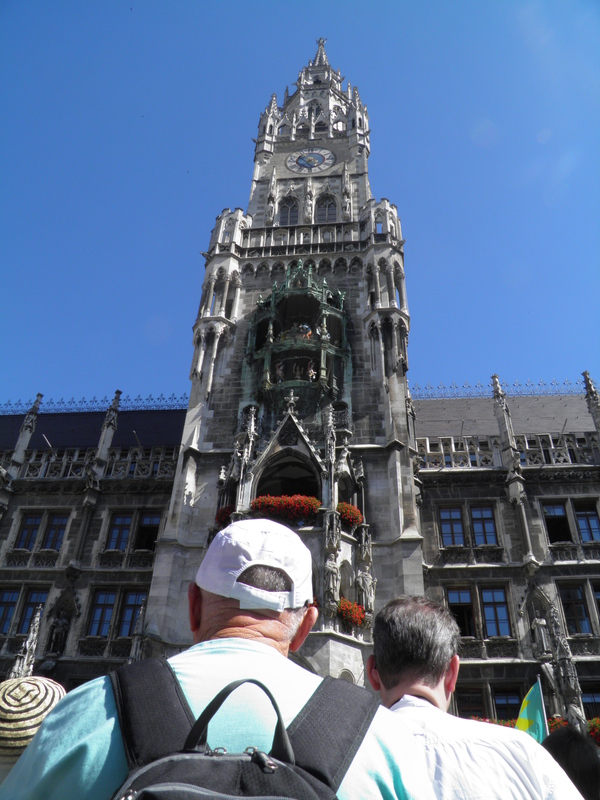 You can see the Glockenspiel every day on our Priceless Munich city walking tour.